The BMW M12/13 turbo 1500 cc 4-cylinder turbocharged Formula One engine, based on the standard BMW M10 engine introduced in 1961, powered the F1 cars of Brabham, Arrows and Benetton. Nelson Piquet won the FIA Formula One Drivers' Championship in 1983 driving a Brabham powered by the BMW M12/13 turbo. It was the first Drivers' Championship to be won using a turbocharged engine. The engine also powered the BMW GTP and in the 2.0 litre naturally aspirated form, the successful March Engineering Formula Two cars. As BMW M12, the engine design since the 1960s became one of the most successful engines in racing. Starting with the European Touring Car Championship, it was also used in Formula 2, expanded to two litre and fitted with four-valve heads, producing over 300 hp (224 kW). In the Deutsche Rennsport Meisterschaft, a 1400 cc variant (with a 1.4 handicap factor equal to 2000cc) was turbocharged by Paul Rosche according to FIA Group 5 rules. At well over 350 hp (261 kW) from the beginning, it rendered the normally aspirated engines in the two litre category useless. After some development, power, driveability and reliability improved, especially in the IMSA car, and BMW began to think about entering F1, where a handicap factor of 2.0 required 1500 cc engines. 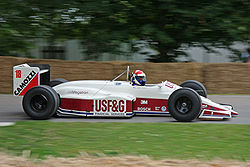 With the BMW badged as Megatron in this A10B chassis, drivers Eddie Cheever (pictured at the 2008 Goodwood Festival of Speed) and Derek Warwick ensured that 1988 was Arrows' most successful year in Formula One, thanks to frequent points finishes. During the 1982 season, the Brabham team, then owned by former F1 boss Bernie Ecclestone, used both the older Cosworth DFV V8 engine as well as the turbocharged BMW M12 in selected races in a development program. The BMW proved to be fast in its first year in Formula One, though its reliability with turbocharging still in its infancy was lacking. Reigning World Champion Nelson Piquet recorded the first win for the engine in F1 when he led home Brabham teammate Riccardo Patrese (in the Cosworth powered car) in the crash marred 1982 Canadian Grand Prix. In 1983, Brazilian driver Piquet won his second Formula One World Championship driving a Brabham BT52 powered exclusively by the turbocharged BMW M12 engine, which in 1983 was producing approximately 850 bhp (630 kW) in qualifying trim and 640 bhp (480 kW) for the races. Piquet, who won the Brazilian, Italian and European Grands Prix in 1983, won the championship by just two points in front of Renault's Alain Prost (Renault had pioneered turbocharging in F1 in 1977, but would be destined never to win the World Championship in the original turbo era (1977-1988)). Piquet's win was the first time a car powered by a turbocharged engine had won the World Championship. The main advantages of the inline 4 M12 over its V6 Ferrari and Renault opposition was with one less turbo, two fewer cylinders and eight fewer valves, the BMW engine had lower frictional losses and therefore thermal discharge than its competitors, allowing Gordon Murray the luxury of designing the Brabham BT52 with smaller radiators, which meant better aerodynamic efficiency and therefore better straightline speed. The BT52 was notable for its very skinny, short sidepods especially compared to the Renault, giving it better penetration through the air on circuits with long straights. 1984 and 1985 were lean years for the BMW engines in Formula One. Piquet scored the Brabham team's last three wins over the two seasons, winning the 1984 Canadian and Detroit races, and the 1985 French Grand Prix, though the engine was generally regarded as the most powerful in F1 at the time, producing a maximum output of approximately 1,100 hp (820 kW) in qualifying trim by 1985. While the engine's potential was never in question with Piquet taking nine pole positions in 1984, however the engine's mechanical reliability and durability under full work load suffered severely with regular engine blow ups and turbo failures becoming a common feature. Also, with FISA imposing a maximum fuel limit of 220 litres per race (re-fuelling was allowed in 1982 and 1983), the 4 cylinder BMW suffered from high fuel consumption which often led to drivers running out of fuel. In the years 1986 and 1987, the version M12/13/1 was tilted sideways by 72° for use in the extremely low Brabham BT55 (1986) and more conventional Brabham BT56 (1987). The design was not successful, probably due to cooling issues in the tight compartment. The BMW GTP IMSA series car was also powered by the 2.0 liter M12 turbo engine, with more than 850 hp in race trim. The 1986 engine was claimed to have produced a maximum output of 1,400 hp (1,044 kW) in qualifying trim, which would make it the most powerful engine of all the turbo-charged engines, as well as non-turbo charged engines, ever used in Formula-1 racing. However it should also be noted that, at the time, there was no actual technical way of accurately measuring horsepower figures over 1,000 to verify such claims made by engineers and racing teams at the time. Claimed output figures were generally accepted from the engineers` theoretical calculations, which were as follows: i.e. 0.1 Bar of turbo boost was rated to be worth approximately 20 hp (15 kW)). During 1986 however it was the Benetton team using the conventional upright BMW M12 who would be the leading BMW runner in Formula One, with Gerhard Berger scoring his and the team's first (and the BMW engine's last) win by winning the 1986 Mexican Grand Prix. Benetton would not continue with the BMW engines in 1987 after the Bavarian company had announced they were pulling out of Formula One, instead they became the de facto factory Ford team using their V6 Ford TEC turbo in the BMW's place. During the 1986 Italian Grand Prix at Monza, Gerhard Berger's BMW powered Benetton B186 recorded the highest straight line speed by a turbocharged Formula One car when he was timed at 352.22 km/h (219 mph). In fact, the top five cars through the speed trap at Monza (Berger and teammate Teo Fabi, Brabham's Derek Warwick and Riccardo Patrese, and the Arrows of Thierry Boutsen) were all powered by the BMW M12. As BMW announced to pull out officially at the end of 1986 (though they would continue to honour their contract and supply Brabham with their tilted engine for 1987), Arrows team boss Jackie Oliver brokered a deal with support from the team's primary sponsor USF&G to continue the use of the upright BMW engines under the name of its subsidiary Megatron, Inc., founded by long-time F1 aficionado John J. Schmidt, who coined the phrase "Horse racing may have been the sport of kings, but auto racing is the sport of corporations". The engines were serviced from Switzerland by Arrows' long time engine guru Heini Mader, a former mechanic of Jo Siffert. Rebadged as Megatron, the BMW engines were used by the Arrows team for the 1987 and 1988 seasons, as well as Ligier for 1987 only. In the final season for the turbos, Arrows were one of only six teams still running turbocharged engines and the only team to still use the old BMW engines. During the 1988 season the Megatron engines were the oldest turbos still in use in Formula One dating back to 1982 (Ferrari, which had been using turbos since 1981, had introduced a completely new engine from 1987). The Megatron programme ended as a result of a change of Formula One engine rules which banned turbocharged engines at the end of 1988, with American driver Eddie Cheever achieving the old BMW engine's last podium finish with third place in the 1988 Italian Grand Prix at Monza. The race was also significant as it was the first time Heini Mader had solved the problem caused by the FIA's boost limit valve which limited turbo boost pressure to 4.0 Bar in 1987 and 2.5 Bar in 1988. By moving the valve closer to the engine, the problem of the turbo not delivering enough boost had been solved and the Arrows A10B's were among the fastest on the long Monza straights, faster even than the all-conquering McLaren-Hondas into which designer Steve Nichols had effectively incorporated elements of Gordon Murray's lowline Brabham design as well as featuring a more powerful V6 engine. With turbos banned from the 1989 season, the Arrows team reverted to using 3,499 cc (213.5 cu in), naturally aspirated Ford DFR V8 power plants. The M12's major shortcoming as a Formula One engine was its lack of throttle response due to turbo lag. Unlike the V6 and V8 turbocharged engines which ran with twin turbos (one for each bank of cylinders), the inline-4 BMW engine, like the other 4 cylinder turbo engines used in F1 such as the Hart 415T and the Zakspeed 1500/4, only used a single turbocharger. The twin turbo setups of the "V" engines eliminated much of the turbo lag. However, with only a single turbo, the BMW M12 suffered from approximately 2 seconds of turbo lag meaning drivers often had to start accelerating through the apex of a corner. The power from the turbo was described by many (including Piquet and Berger) as coming on like a light switch which often induced power oversteer in BMW powered cars. This was a major reason that the BMW was generally seen at its most competitive at power circuits such as Kyalami, Imola, Paul Ricard, Silverstone, Hockenheim, the Österreichring and Monza. On tighter tracks such as street circuits like Monaco and Detroit which required greater acceleration and less top speed, the BMW powered cars often lagged behind their major rivals. The Formula 2 M12 was also the basis for the highly successful BMW M3 Group A touring car. The 2.3 liter engine powered the M3 (which really was a middle class car compared to its rivals such as the Ford Sierra RS500) to the 1987 World Touring Car Championship, the 1987 and 1988 European Touring Car Championship's, the 1987 Australian Touring Car Championship, the 1988 British Touring Car Championship, the 1987 and 1989-93 Italian Touring Car Championships, and the 1987, and 1989-90 German DTM championships. The engine also proved its reliability with 4 wins (1987, 1988, 1990 and 1992) in the Spa 24 Hours (the 1990 and 1992 wins where with the upgraded 2.5 litre "evolution" version of the engine). Wikimedia Commons has media related to BMW M12 engine.